Apple’s iTunes Radio hasn’t really taken off since launching alongside iOS 7, and given the Mac maker’s position among the pioneers of the digital music revolution, it’s a pretty sorry state of affairs. Still, this week and weekend is all about Thanksgiving (read: free stuff), and courtesy of Verizon, interested parties can score themselves access to iTunes Radio without the usually featured ads. Moreover, there’s also $5 of iTunes Store credit to be snapped up for a limited time only, and if you want to join in this bonanza, check out the details after the fold. Unfortunately, the Verizon offer of unadulterated iTunes Radio only runs for today, so you’ll have to jump on the bandwagon quickly if you don’t want to miss out. On the flip-side, though, the deal is not limited to Verizon customers, so even if you’re carried by AT&T, T-Mobile or one of the many other local and national network operators, you can still score yourself some free music. 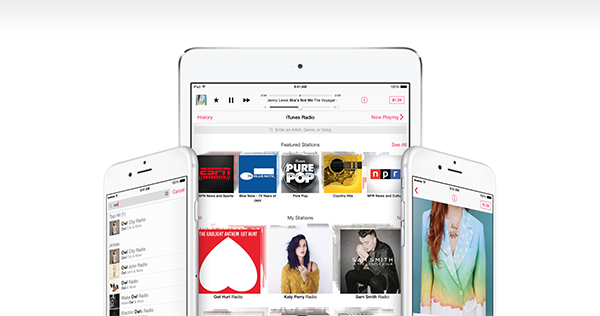 As for the $5 iTunes credit, you’ll have to click on a banner ad from within the iTunes Radio app to claim it, but once you’ve run through this simple step, you’ll be able to spend your five bucks on anything from music to videos, apps, and other such niceties buried within Apple’s vast hub of content. Aside from the fact that the iTunes Radio access is limited to the end of the day, there’s also a caveat for those already subbed to iTunes Match. 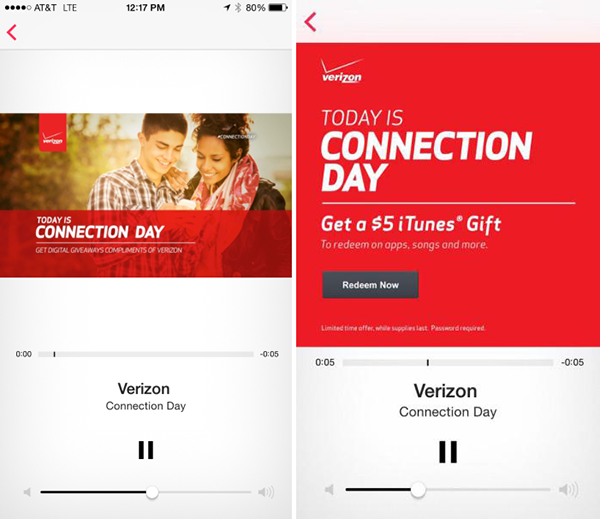 From what we can gather, Match customers cannot claim their $5 free Store credit, and since said users already have the option of iTunes Radio without ads, this “Connection Day” offer from Verizon won’t benefit you if you’re already on iTunes Match. Still, if you’ve always been curious about iTunes Radio – I’d be willing to stake that many of you had forgotten it even existed, mind – then take full advantage of Verizon’s special promotion. As you may already have deduced, this is a U.S.-only enterprise, but if you do live Stateside, be sure to dive in before the offer expires. And finally, stay tuned to our coverage for more great offers leading up to Black Friday through Cyber Monday. What would really be nice is if they pull a TMobile and remove iTunes radio and others from their data charges. I only saw the first one, and tapped on it with no effect. I haven’t seen either of the ads since. Is it not available anymore? Now I actually understand it. I think. Those 5 second clips are reminding you that it is connection day (photo 1) while when you see the second ad (very rarely I assume) you have 10 seconds to tap on the redeem now button to get the $5. I’m still trying after listening to pop music for about 2 hours now. I’m quite sure if you’re familiar with jailbreaking and Cydia, you’d also know which tweak to install for iTunes radio. It’s nothing new.